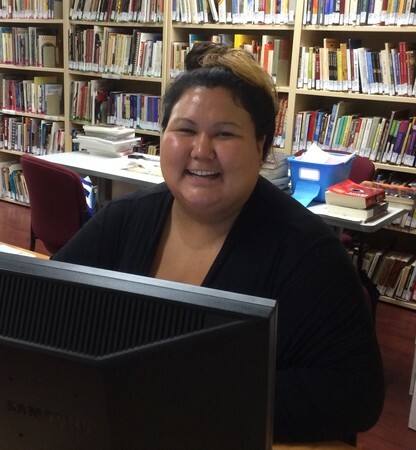 The Victoria Native Friendship Centre Library opened to the public on May 28th, 2014. Our mandate is to support literacy programs in the community, encourage a love of books and reading, and raise awareness of the valuable and impressive history, accomplishments, knowledge and skills of Aboriginal people. On March 9th, 2018, the library was re-named the Bruce Parisian Library to honour the recently retired executive director, Bruce Parisian. Bruce was executive director of the VNFC for over 18 years. He bought the original collection of Indigenous books. The Library has expanded in the last few years to the point that more space was required. 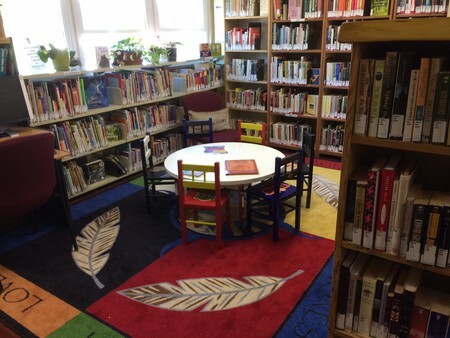 The number of items in the collection is over 5500 now, with 70% of the books being either by Aboriginal authors or having Aboriginal content, The Library moved to a larger space in February 2017 and we encourage you to come to visit and take out a membership, if you have not already done so. Information about joining the Library is included elsewhere on this web page. Our hours are subject to volunteers being available. Stay tuned - plans are in the works. Q: Who can use the Library? A: Members of the public may visit the Library and use its resources during open hours. Visitors to the Friendship Centre are invited to become members of the Centre, and may then borrow items from the Library. Children of adult members of the Centre may also borrow books. Membership in the Victoria Native Friendship Centre costs $1 per year. Q: What items are available in the Library to use and borrow? Q: How did the Library come about? A: Our story: the Library began as a vision of the Centre's Executive Director, Bruce Parisian, when he purchased the initial Aboriginal collection of books from local bookseller Remi Paul. Bruce had some shelves built and installed in a space the size of 1/3 of a classroom. The books sat on the shelves in boxes until some time later, when Bruce spoke at a Federal Liberal breakfast meeting about the work of the Centre, and Carol Williams who was in the audience, asked if there was something she could volunteer to do at the Centre. Bruce asked her to unpack the boxes, organize the books and put them on the shelves. Carol convinced Sherry Wheeler, Sharon Apsey, and Jennifer Ferris to volunteer, as well. These first volunteers asked Barbara Strachan, a retired school and public librarian, to join them in their task. Later, Lowell Ann Fuglsang came on board to set up a spreadsheet database to record the books. The unpacking task involved stamping the books and placing them on the shelves in categories and alphabetically. Once that task was complete, the original team left while Barbara and Lowell Ann stayed on to organize the collection similar to a public library. Robyn Whitbread and Lynne Hancock heard about the project from Barbara and Lowell Ann and were delighted to join in. The team of four began work on this project in 2012. The Greater Victoria Public Library staff and administration have been supportive with advice, and they provided surplus shelving and furniture, when they moved to their new Emily Carr Branch Library. 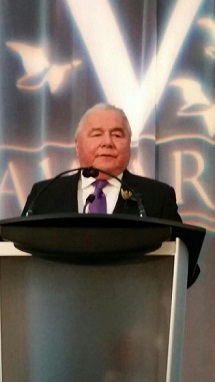 The involvement of the Victoria Native Friendship Centre Board, led by former President Ron Rice, and now President Shelley Cardinal, has been invaluable in the development of the Library, providing financial support and offering advice in the development of policies for administering the Library. Janice Simcoe, a member of the Centre Board, sits on the Library Advisory Committee with a core group of volunteers. Our former staff liaison person was Leslie McGarry, whose artistic abilities and cooperation were greatly appreciated, as well has her gracious hosting of many special events. VNFC Executive Director Ron Rice is the current liaison with the Library. Barbara Strachan, who has been volunteering at the Library since the beginning, believes its time for someone else to take on leading the Library into its next phase of development, and she is retiring from her volunteer position at the end of August 2018. she is grateful to all involved in the serendipitous evolution of the unique Bruce Parisian Library. Many people have participated in the establishment and development of the Library into the valuable resource it has become for VNFC staff members, students of Camosun College, the University of Victoria and Institutions beyond, Library members and residents of the Victoria area. Q: Has the Library received any other assistance? A: The Times Colonist Raise-a-Reader Campaign provided generous grants in 2014, 2015 and 2017 to purchase recommended books for children and young adults. Remi Paul, a local bookseller, and staff members at Russell Books of Victoria located the requested books, plus others, and provided them at a discount. More recently, Munro's Books and Strong Nations Publishing in Nanaimo, BC have also provided books at a substantial discount. Generous donations were received in 2016 from the Greater Victoria Public Library, the Canadian Club of Victoria, the First Unitarian Church of Victoria and the Rotoract Group at UVIC. 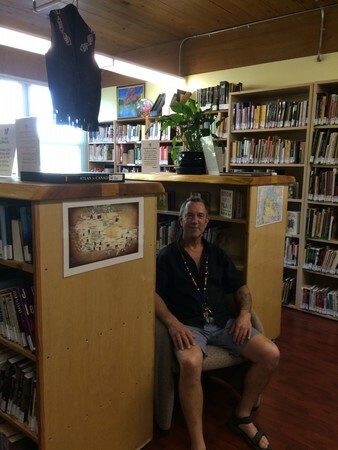 We also gratefully thank Dennis Pierson of New Vintage Renovations for donating the time and materials to create three new shelving units for the library. Recently, Daniel Ouimet of New Vintage Renovations created beautiful mobile shelving units that have allowed the library collection to grow some more. Q: How many volunteers are now involved? Do you need more? A: Usually, we operate with about 10 volunteers each week. Potential Library volunteers are invited to call the Centre at 250-384-3211 Ext 2292 to ask about the required qualifications and available times to volunteer. Q: Are there going to be any programs or events in the Library? A: We now offer Storytimes for the children in the new XAXE- STELITKEL Daycare which opened in September 2016. Three groups of children come to the Library on Wednesday mornings to hear stories read by Library volunteers Dale and Lois and through the summer months by Debbie and Christin. In 2017 the VNFC Library collabarated with the Greater Victoria Public Library in presenting a speaker series entitled Reconciliation: Opening the Doors to Conversations. The four free events were funded through the Victoria Foundation with a grant from Canada 150, a feredal initiative. In past years, the Library volunteers have shown films or presented speakers with themes of interest.to VNFC members and guests approximately four times each year. Q: Does the VNFC Library accept donated books? A: We have accepted many donated books for both collections, but our emphasis is on the Aboriginal Collection. Donated books, if not added to the collection due to space and / or appropriateness, will be sold at a minimal price to add to the Library funds. We hope that local neighborhood residents, as well as the people who come to the Centre to use its various services, will feel welcome to come to the Library for their reading and information needs.